Press Preview for Scion + Giant Robot: "Insiders, Outsiders & The Middle"
Los Angeles - July 2008 -In conjunction with Giant Robot, Scion presents Insiders, Outsiders & The Middle at its 4,500 square foot Installation L.A. Gallery. At Giant Robot, the definition of art ranges from straight contemporary painting to sculpted figures (which were considered action figures just a few years ago). This exhibition celebrates not the disparate mediums, but the divergent mindsets of artists--as well as the gray areas. Insiders are artists who work so hard in front of their computers that they don't leave their chairs long enough to hang their pieces on walls. More often, their art is found onscreen, in print, and on T-shirts. Adrian Johnson is an example from the U.K., with a retro drawing style inspired by children's books. The other Insiders are from Japan. Noriko Ashino runs the A Piece of Design firm, and specializes in a variety of disciplines including character design and graphics. Sometimes known as ZariganiWorks, the duo of Taro Mukasa and Yoshitane Sakamoto are responsible for the infamous Suicide Bomb Button, have created the Kore Janai Robo (which has gone from handmade wood figurines to vinyl characters with a TV show), and freelance design toys, characters, and products. Outsiders include Space Invader, a street artist from Paris who makes his mark on walls around the world and calls each tiled piece an "invasion." He painstakingly documents each one before it gets ripped down—either by city workers or collectors—and publishes his work in books and maps. Kami is revered as a graffiti legend in Tokyo and has successfully transitioned from the streets to art galleries. His pieces often resemble flowing water. And then there's The Middle. The original work of Kyoto-based Shinya Yamamoto has been found in many exhibitions as well as the drum set of Sonic Youth's Steve Shelley. Part Basquiat and part left-brain madness, his style is free flowing and dreamy. Nao Harada, proprietor of the Wrecks clothing line, sketches, draws, and paints with no regard to the meaning of art. He rides around on his BMX leaving stickers and tags around Tokyo. The lone American in the group, Ed Trask, is from Virginia. He tours constantly as the drummer for the veteran punk band Avail. Through painting, he recalls and reinterprets the slices of Americana that he sees on the road. Although there is no obvious correlation between the artists, they form a powerful cross-section of creative forces that are physically active with their art. They belie the image of the stationary artist and pose the question of how they will co-exist in a restrained gallery setting. 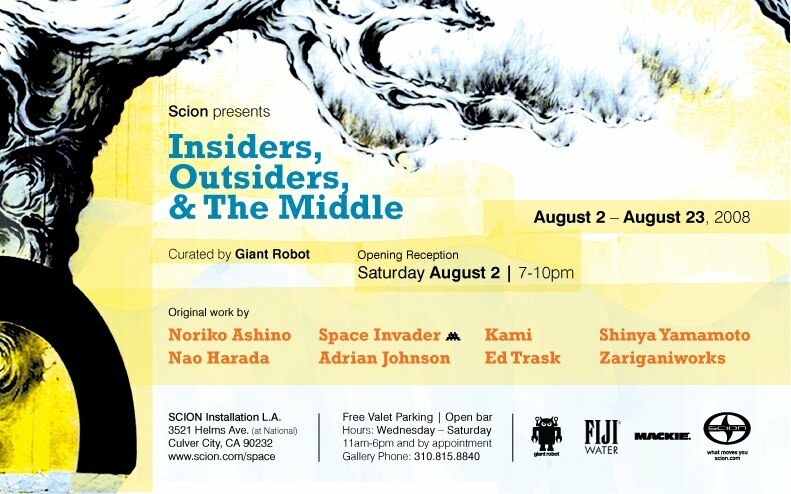 The opening reception takes place August 2, 7:00 P.M. – 10:00 P.M. at the Scion Installation L.A. Gallery, 3521 Helms Ave. (at National), Culver City, CA 90232. The show will run until August 23. Dedicated to fostering independent artistic expression, the Scion Installation L.A. Gallery is a space that allows artists to explore their creative visions. The Scion Installation Gallery hosts art shows and art-related events for cutting-edge artists from across the globe. Gallery hours are Wednesday through Saturday 11:00 AM – 6:00 PM and by appointment - 310.815.8840. For more information, visit www.scion.com/space.